1/4 cup confectioners’ sugar for topping. Preheat oven to 350 degrees. Add the maple syrup and honey to the butter in a bowl and beat until smooth and creamy. Then add the egg, milk and vanilla and mix well. Combine the flours, cinnamon, salt, and baking powder. Slowly add to the butter mixture and mix them well together. Add the cream cheese and mix well into the batter. Now add the nuts, mix well. Then add the blueberries and mix gently. If they're frozen, it's easier to mix without getting blue batter and no berries! Pour the batter into a greased tube pan. Bake in the oven for 45 minutes. Use a cake tester or toothpick to test when done. If you stick the toothpick into the middle and it comes out clean, it's probably done. It should brown slightly at the edges and pull away just a bit from the edge of the pan. Take it out of the oven and let it cool for a good half hour to an hour before removing from the pan. Just place a large plate upside down over the pan and turn them both over. or wait till it cools and sprinkle the top with confectioners’ sugar. *If your blueberries are on the tart side, you can add a little extra maple syrup or honey, but not too much or the blueberry flavor will be lost. **You can substitute just about any kind of chopped nuts for the walnuts or even use sunflower seeds. ***You can also substitute for the blueberries. Raisins may be good, or other berries. 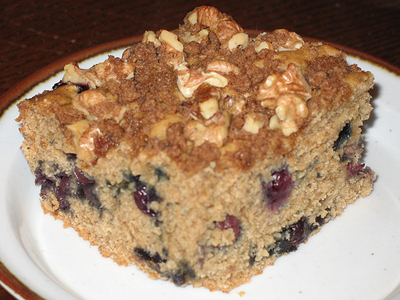 Because of the blueberries, keep this cake in the refrigerator!